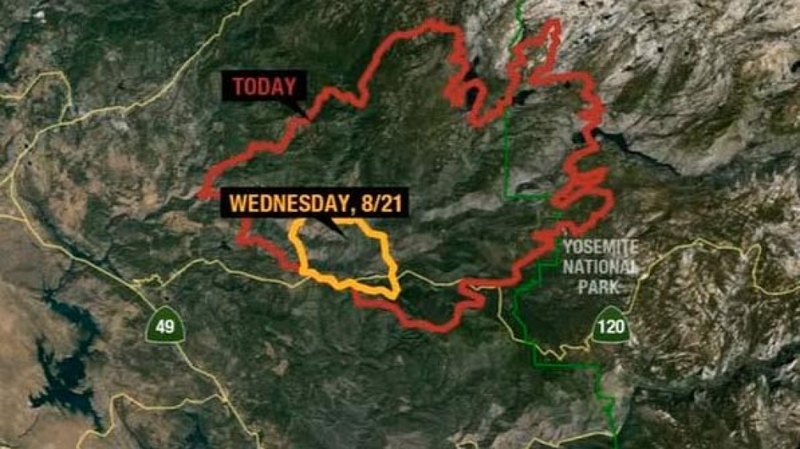 The massive Rim Fire near Yosemite National Park in California is an example of how drought can amplify wildfires in a warming, drying West. The fire, which now ranks as the 14th-largest wildfire in state history, has been racing through parched stands of oak and pine trees, and threatening some of the region’s iconic giant sequoia trees. The vegetation in the area, and indeed across much of central and southern California, is extremely dry, as the state has experienced its driest year-to-date. The Rim fire burning in central California, near Yosemite National Park. California received a record-low 4.58 inches of precipitation during the January-to-June time period. That total was 1.69 inches below the previous mark, set in 1898, according to the National Oceanic and Atmospheric Administration, and nearly 10 inches below average. 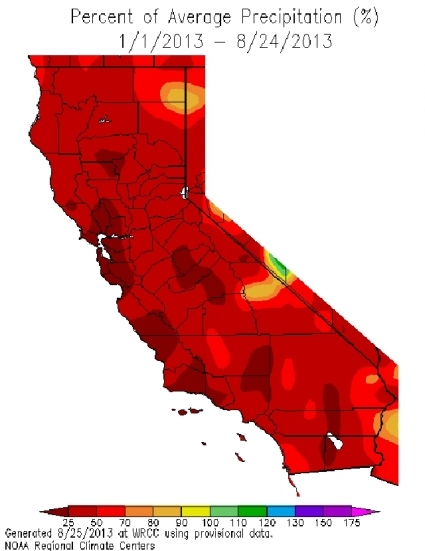 A wetter-than-average July in California did little to alleviate drought conditions. Because the state typically receives very little rainfall during the summer, even light amounts of rainfall can push totals above average without putting a dent in the drought. To make matters worse, a major heat wave in July helped further dry out soils, making forests primed for fire. Parts of the West have been warming faster than the rest of the lower 48 states since the 1970s, a trend tied to climate change as well as natural climate variability. “We have a lot of background variability from year to year and decade to decade in precipitation and rain and snow,” Westerling said. “But that (increasing) trend in temperature means that you have more evaporation” throughout the seasons, which is “really is exacerbating the natural drought periods. A look at the Rim fire's growth since last Wednesday. The current tinderbox that is the Central Sierra Nevada Mountain range can be traced back to the winter, when precipitation suddenly cut off. Jeanine Jones, an interstate resource manager with California’s Department of Water Resources, said record precipitation during the first part of the 2012-13 winter helped bolster statewide water supplies enough to allow California to avoid serious water supply concerns this summer. The dry second half of the winter, though, contributed to the state’s wildfire woes, Jones said. After January, “the faucet shut off,” Jones said. Such a bipolar winter, with little spring snow, may be a sign of winters to come in a changing climate, she said. Jolyne Lea, a hydrologist with the National Water and Climate Center, said some weather stations at high elevations in the Sierra Nevada Mountains had near record low snowpacks during the 2012-13 winter. 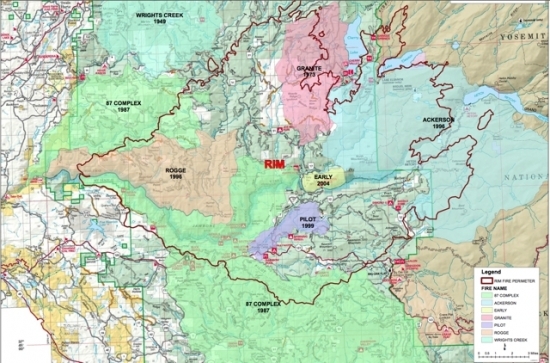 As an example of how little snowpack remained this spring, according to Snyder, summer recreation in some parts of the Stanislaus National Forest began in June, a full month earlier than normal. Percent of average precipitation so far this year in California. “Early snowmelt dried things out significantly all across the forest,” Snyder said. A July heat wave, brought multiple 100°F-plus days to the Stanislaus forest. (That same heat wave caused Death Valley, Calif., to come close to tying its record for the hottest temperature recorded on Earth) “That helped further dry things out,” and pushed fire weather danger very high due to the abundance of very dry vegetation, Snyder said. “There’s lots of stuff out there available to burn and conditions are right for it, so we’re having a really serious problem trying to corral this fire,” he said. The conditions that have contributed to the explosive growth of the Rim Fire have become more common across much of the West in recent decades. In the western states, including California, years with above-average temperatures, reduced spring snowpack, and early snowmelt tend to be years with bigger, longer-lasting fires. Research has also shown a general shift in forest fire ecology across the West, with a significant increase in the number of large, long-duration wildfires in many areas starting in the mid-1980s, a trend that has been attributed to a combination of climate change, land use change, and shifting fire suppression strategies, among other factors. In the mountains of the Sierra Nevada in particular, decades of government policies to extinguish many natural wildfires rather than letting them burn themselves out have led to a buildup of vegetation, or “fuels,” for today's fires to burn. “We do regularly suppress fires allowing only a few natural starts to burn along with prescribed burning for resources benefits,” Snyder said. According to data Snyder provided, there were at least five large wildfires since 1973, including the Tuolumne Fire in 1987, which killed a firefighter and was the previous record holder for the largest wildfire in the Stanislaus National Forest. History of large wildfires that burned in the same area as the Rim Fire. Click image to enlarge. Credit: U.S. Forest Service. There are more large fires (greater than 10,000 acres) burning now than at any time in the past 40 years, and the total area burned each year has also increased. The top eight worst wildfire years since 1960, in terms of acres burned, have all occurred since 2000, according to NIFC data. 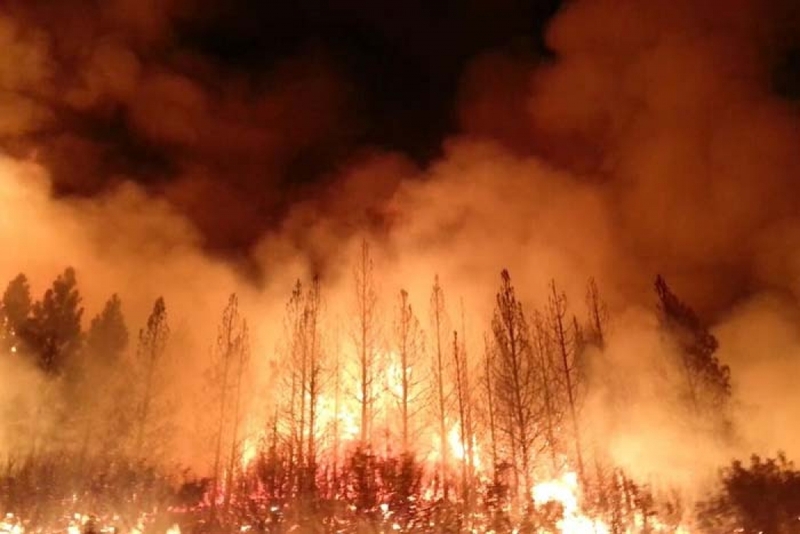 According to Climate Central research, in some states, such as Idaho and Arizona, the number of large fires burning on U.S. Forest Service land each year has tripled or even quadrupled since the early 1970s. In other states, such as California and Wyoming, the number of large fires has doubled. The Rim fire is one of 36 large fires burning across the U.S. as of Tuesday, and firefighting resources are stretched so thin that the nation’s wildfire readiness is at its highest level in five years. However, the number of wildfires and acres burned to date are not unusual in the context of the past decade. So far this year, there have been about 33,000 wildfires in the U.S., according to NIFC data, with 3.5 million acres burned. That compares to a 10-year average of 54,000 fires by this point in the year, with about 5.8 million acres burned. The problem firefighters are facing is that so many large fires have erupted at the same time. Many factors are involved in creating conditions that are primed for large wildfires. In addition to warming temperatures and changing snowpack trends, decades of fire suppression strategies have left large tracts of forest with excess fuel to burn. Increased human development near traditionally fire-prone ecosystems has contributed to an uptick in damaging fires, and natural climate and weather variability plays a large role as well. Researchers predict that the area burned in the West may quadruple for every additional 1.8°F of average surface temperature rise. That is particularly ominous, since according to the most recent climate model projections contained in the draft U.S. National Climate Assessment, average temperatures could rise between 2°F and 4°F across most of the U.S. within the next few decades, and by as much as 8°F by 2100. The assessment, along with other studies, have projected an increase in drought frequency and severity in parts of the West, particularly the Southwest, which has benefited from an active summer monsoon season this year.